I loved the 2016 Paralympic Track Cycling – so many amazing races, great riders and wonderful moments – so I’ve collected what I’ve found from it, so you can re-live it, or catch up on the racing if you missed it. I’ve focused on the women’s racing, because overwise this would go on for days, but of course, all the sources I’ve linked to include the men, if you want to have a look for more, and the general overviews include their races too. Please forgive that fact I’ve got a lot of British-based coverage – it’s because it’s really good, and obviously because I get to see it! I’ve got coverage from other countries when I’ve seen it, but if you’ve seen good coverage from other countries that you want to share, please do let me know, and I’ll edit it in. UK-based highlights on the Channel 4 Paralympics site. Seems like there’s lots of highlights on Team USA‘s website, but it’s all forbidden from my UK-based server. There are lots of video highlights of the Australian Paralympics on the 7Two YouTube. This is going to be an incredible competition – the Para-cycling Track World Championships, in Aguascalientes, Mexico – 10th-13th April 2014. 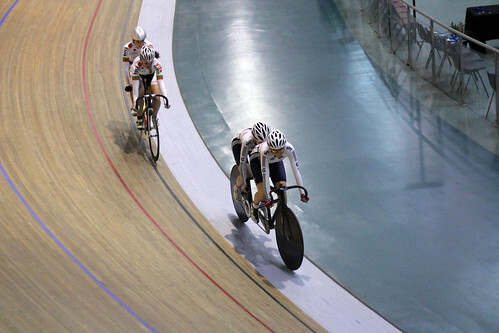 Track is always great racing, and the Aguascalientes velodrome is very fast indeed, and at altitude to boot – and given there are so very few chances for the para-cyclists to race on the track, they always bring it, and hard, with every opportunity they get. Here’s the UCI’s portal, which includes the schedule, startlists and results – and it looks like there could be live streaming from there UPDATE! although the Ustream window and what looked like it would be a link to live streaming have disappeared from the page now… and apparently there’ll be video highlights on the UCI youtube at the end of each session – I’ll update with details as soon as I know more. And here’s the race website. I’ve made a twitter list of cyclists racing the Worlds, and I’m updating it all the time – there are some fantastic tweets, photos and media coming out from the riders, so follow them all! Here’s the Cycling Australia twitter list of their riders too.